Jane's Delicious Garden - To watch a video of The Urban Box click here! To watch a video of The Urban Box click here! Introducing The Urban Box, a multifunctional container for everything from growing organic vegetables to mobile storage for patio cushions or children's toys. Utilising recycled wood from strong shipping pallets, its unique and innovative design allows for numerous variations of colour, size and height. ﻿﻿Useful options include wheels and a convenient handle. When a lid is added, The Urban Box transforms into a storage unit that doubles as seating. With waterproof paint on the interior The Urban Box is a perfect growing container and will provide space-pressed gardeners with fres h, home-grown produce for years to come. It is ideal for those with mobility or back problems and is an excellent choice for patios, balconies and rooftop gardens. 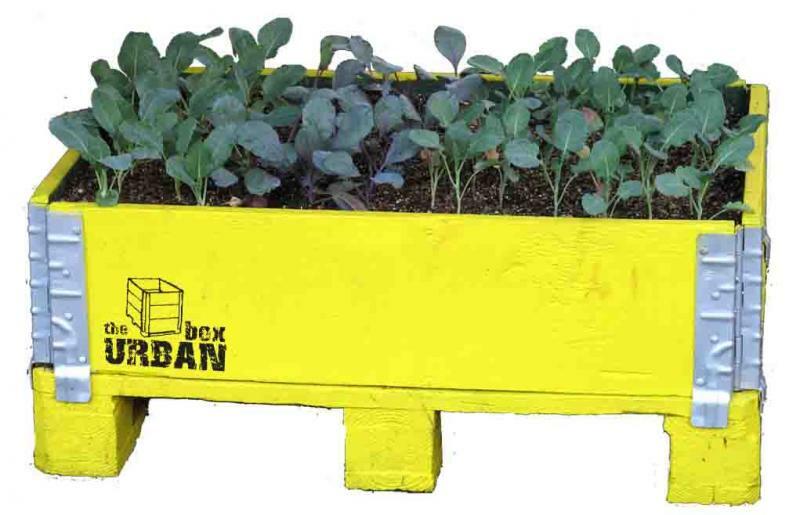 With space saving Urban Boxes an abundant harvest can be gained from a relatively small area. We provide a wide choice of exterior colours, using environmentally friendly and non-toxic paints, to create Urban Boxes to suit all tastes. Available in 25 colours plus white.